Due to the lack of real knowledge about the subject matter of Sanatana Dharma’, now-a-days asanatana dharma is being spread as sanatana dharma. People, lacking the knowledge of the real meaning of sanatana dharma, are considering sanatana dharma as the religion of Hindus only; which is very limited conception. What is the real meaning of sanatana dharma? 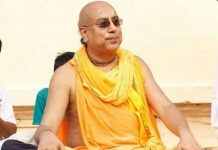 Following is an excerpt from a lecture given by the president-acharya of Sree Caitanya Gaudiya Math, Sree Srimad Bhakti Ballabha Tirtha Goswami Maharaj on the topic of sanatana dharma. One thing is dharma’ and another is religion’. Both do not convey same meaning. We do not find any other word in English, so we use religion. In the oxford dictionary the meaning of religion is, “A system of faith, especially personal God entitled to obedience.” Therefore religion’ word is not a proper translation of the word dharma’. We should understand it very well that performing rituals alone is not dharma. Upasana (worship) is the method. Mind will get purified by the remembrance of Supreme Lord (Bhagavan). Pure mind will result into love for Supreme Lord and love for Supreme Lord will cause the development of love for all the living beings related to Him. There will not be any violence towards anybody. Therefore love for Supreme Lord is the highest dharma. Srila Sacidananda Thakur speaking in relation to the word dharma’ mentions that the meaning of dharma’ is nature’. Whatever the nature of each, is their dharama. In reality, dharma is of two types: Naimittik dharma (temporary dharma) and Nitya dharma. (eternal religion). For example, the nature of water is liquidity. However due to excess cold it takes the form of ice, and on getting heat, again change to water. The cold was the cause for the water to become ice, so ice is the naimittik dharma of water and liquidity is eternal dharma. Similarly, two kinds of dharma have been seen for the jivas (living entities). Naimittik and Nitya. But before understanding these, we must understand what is the nature of jiva. Because only when the knowledge of the nature is there, it can be better understood which dharma of jiva is Naimittik and which is nitya dharma? Now let’s try to understand who is jiva in nature? Normally we understand body as the person, but do not tell body as person. We use the following terminology in our daily use – my body, my mind, my intelligence etc. Nobody says I am body, I am mind’. This explains that the speaker of I’ is different from body. Even if we see externally, nobody identifies body as the person. Whether it’s an atheistic country or theistic, everywhere until the body has the conscious principle it is considered as a person. On loosing conscious principle, nobody calls the dead body as a person. So burning the dead body, giving it to animals or birds, does not cause any punishment. And nowhere the dead body has the right to cast vote. Until the body has conscious principle, which is also called as atma or soul in the scriptural language, it is identified as a person and not a body. Until the atomic soul, the energy of the eternally existing, eternally blissful, eternally knowledgeable Supreme Lord, remains in the body, it is identified as a person. By the existence of that principle, I’ remains and by the absence of that principle, I’ do not remain; that is my nature (means, I am a soul). Soul is eternal, body is not eternal. Now let’s think about the real position of the living entities (jivas). Where from the living entities came? What is it’s dharma? Lord Sri Krishna tells about it at one place in Gita that living entities are parts of His energy. However, at another place he says that they are His own parts. On the basis of second statement, some say that jiva is part of Bhagavan, so he is also Bhagavan. However this is not correct. The jivas are not mentioned as Bhagavan here. Both of the Gita’s statements should be taken. Lord Krishna says, “apareyam itas tv anyam prakrtim viddhi me param! jiva-bhutam maha-baho yayedam dharyate jagat!! (O mighty-armed Arjuna! There is another, superior energy of Mine, which comprises the living entities). According to Gita, living entities are not part of Supreme Lord, a part of His energy. Because the part of the Lord is Lord only. Every part of infinite is infinite. The part of Lord is called as svamsa, all incarnations are Lord Krishna’s svamsa. Every part of infinite is infinite, but part of the energy of infinite cannot be infinite. For example, the part of sun will be sun, however his light rays cannot be called sun. Even all the light rays collected together cannot be called sun. Similarly living entity (jiva) is part of Lord’s energy, not of Lord’s. The jnanis explain tattvamasi’ as You are that’. However Vaisnava teachers refute it and explain it as, tasya tvam asi, you are His or you are His (Lord’s) servant. Sun is 14,00,000 times the size of earth. If the sun’s light is coming to my room by window, then I cannot say that sun has come to my room. Sun is 14,00,000 times of the size of whole earth, how can it come? It is the light rays of sun or the part of sun’s energy. Even all the light rays collected together cannot make sun. Sun gives light, light does not become sun. Lord has infinite potencies or energies, Gita talks about two of those, superior’ and inferior’ potency. Living entities (jivas) are superior energy. Material and subtle bodies are inferior energy. 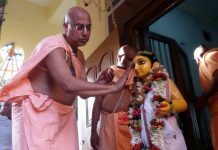 Sri Chaitanya Maharprabhu made it more clear that jiva is the part of Lord’s marginal potency, atomic conscious. Jiva is from Bhagavan, in Bhagavan, from Bhagavan and therefore for Bhagavan. For example, if one asks the finger of hand, who are you?’ and finger were to reply I am the person’. If we take the photo of finger, someone may get misunderstanding about person, because that is not a person. Similarly, if we consider jiva as Bhagavan, then we will be misunderstanding Bhagavan. Just like, finger is a small part of body, jiva is also a small part of Lord’s potency, not the complete Lord. Some people also say that we were Lord earlier, however became jiva by the influence of maya and we will become Lord again by chanting Soham! Soham!. This is completely wrong. This is not scriptural injunction. Because Lord can never become Jiva, Absolute is always Absolute. Therefore Lord is eternal. Lord’s potency is eternal. Jiva, the part of Lord’s potency, is also eternal. Their relationship is also eternal and their dharma is also eternal. This is called as eternal dharma or Santana Dharma’. 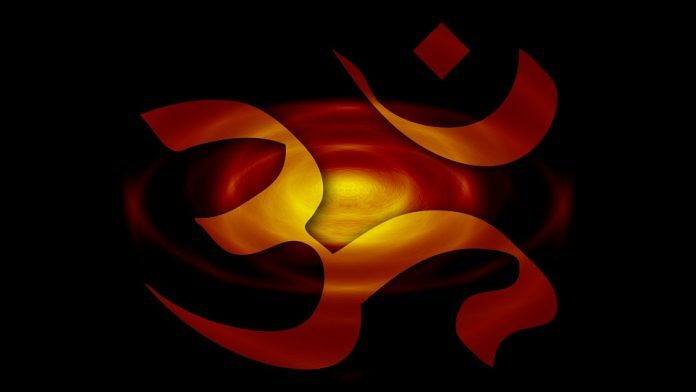 The meaning of Sanatana is, whatever existed in past, is existing and will remain to exist. However the dharma of body is not sanatana, because the body is destructible. Mind. The subtle body made of mind, intelligence and ego, is also not eternal. When one’s tendency for sensual enjoyment ends, his subtle body also ends. Therefore the dharma of destructible thing cannot be Sanatana Dharma’. This is called as Naimittik Dharma’. Due to the influence of maya, soul has got two coverings, first is material covering and second is subtle covering. Both of these bodies have different nature. How many different types of material dharmas we have in our India? Geographical barriers, Social barriers, National barriers! But the soul is superior to mind and body. It is eternal. Therefore it’s dharma is also eternal. Sanatana dharma is dharma for not only India, but it is the dharma for all the living entities, who are in innumerable universes. The essence is that soul is eternal, body is destructible. Therefore all body related dharmas are destructible and only soul’s dharma is eternal. Living entities are part and parcel of Lord’s potency. Potency is always under the control of potent and serves the potent. Similarly the service of Lord is the highest duty of living entity. 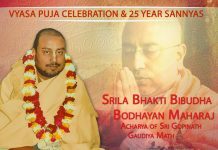 This dharma of soul is known as Bhagavat dharma, Sanatana dharma or Vaishnav Dharama. This is natural dharma of the living entities. Gaur Premanande! Hari Hari Bol!